Over the Summer we were delighted to design and develop this heating controller prototype for the thermal energy domestic market in the UK for an existing customer. Once the custom plastic PCB unit prototype was signed off, we then went on to manufacture a production run of 50 units. This rack mounted custom plastic unit houses a PCB with 4 LED indicators that use light pipes of acrylic bonded into the unit that feed the light from the PCB to the front panel illuminating the plastic. The traffic light (red, green, orange) colours show through the plastic as required. This illumination method leaves a smooth, solid plastic surface which looks stylish and cutting edge. 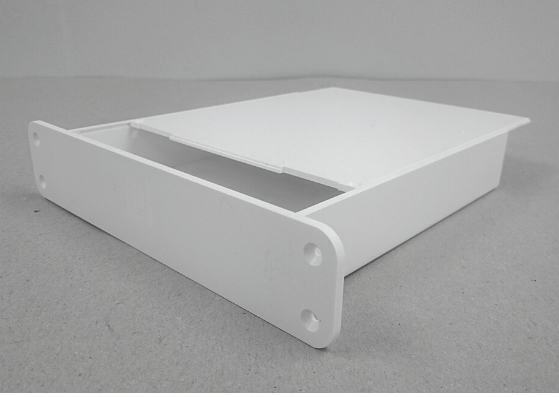 This 200mm and 170mm rack mounted plastic PCB unit in a white gloss, has a clean, modern look for display in households. So, if you need expert help with your next custom PCB plastic unit or casing project, talk to the UK’s design and technical enclosure specialists at CDT on (01280) 845530 or contact us. We will be happy to help you.